The aging operating system, still in wide use, leaves support in January 2020. Believe it or not, a large number of businesses haven’t upgraded to Windows 10 yet. Here’s why they should. About 184 million commercial PCs - in small- and mid-sized businesses, in large enterprises and in government agencies - are still running the quickly aging Windows 7, according to Microsoft. That number included all markets except for China, the company said, with the largest percentage - one in four PCs, or approximately 46 million - in the U.S.
Microsoft brought up the 184 million Windows 7 PCs earlier this month during its Inspire conference, where the Redmond, Wash. firm touted the partner opportunities during the home stretch of the Windows 7-to-Windows 10 migration. Windows 7 is slated to drop off support Jan. 14, 2020. After that date, no security updates will be provided. In other words, most customers have just 18 months to get off Windows 7 and onto a newer operating system - Windows 10 is really the only choice - or risk leaving systems unpatched and thus at risk of hacking and exploitation. Many businesses have already shifted to Windows 10, Microsoft claimed. 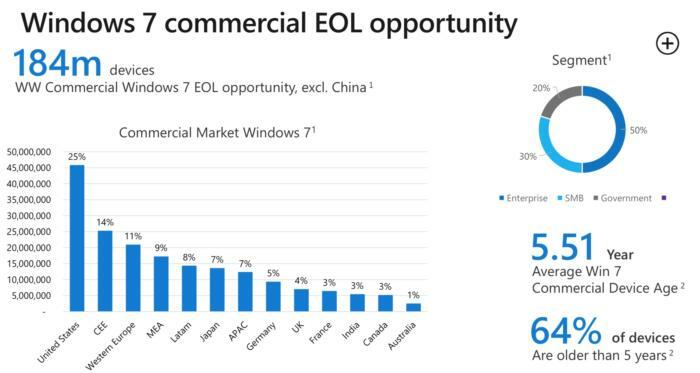 Among the other statistics it trumpeted at Inspire, Microsoft said that there were 200 million commercial Windows 10 active monthly devices worldwide, or slightly more than those still on Windows 7 (excepting the massive Chinese market). Of the commercial PCs still on Windows 7, 50% were within enterprises, 30% in small- and mid-sized businesses, and 30% in government. Nearly two-thirds of those machines were older than five years old, Microsoft said, a potential gold mine for partners bundling new hardware, software and services for customers eager to deploy Windows 10. Microsoft said about 184 million commercial PCs around the world – excepting the People's Republic of China – still run Windows 7, and so were a target for partners hoping to cash in on the migration to Windows 10.